Our beautiful Residence 9 composite doors perfectly replicate the traditional timber door with flush fitting sashes, providing a thermally efficient, durable and low maintenance alternative to high-end luxury timber doors in any style of property, heritage or modern. Make a beautiful and lasting impression with our elegant Residence 9 composite doors. Our composite doors offer a flawless and timeless design which out performs its contemporaries. Available to customers in Lincoln, Nottingham, Newark, Grimsby and surrounding areas, our Residence 9 composite doors make a stunning addition to any property type. 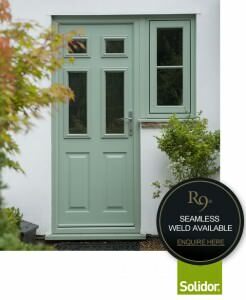 Our classic residence 9 composite doors are built to match the classic appearance of timber and is manufactured using the latest uPVC technology making it extremely secure, efficient and weather-proof. Our doors are certainly built to last. So authentic are our composite doors, that they can be considered for use in conservation areas. These doors are perfect for maintaining traditional aesthetics, without encroaching on the property itself. Our composite doors will sit beautifully within period settings. Combining a traditional appearance with clever uPVC technology, our composite doors are more thermally efficient, durable and low maintenance than standard timber doors. Built using a mixture of high-end materials, our residence 9 composite doors are a luxury alternative to wooden doors, providing exceptional insulation as well as being fully weather-proof. Manufactured using an innovative nine-chambered profile, our composite doors provide superior energy efficiency and security. Highly robust, our composite doors are extremely durable and will give your many, many years of outstanding performance. Our composite doors offer more insulation than standard timber doors. Their superb thermal properties combined with excellent sound proofing and incredibly attractive style choices, make them the most wanted door design for period properties. Our composite doors have no maintenance requirements other than an occasional wipe clean. These doors will never rot, and will never require re-painting. Extremely low maintenance and highly weather resistant, you won’t have to concern yourself over their upkeep. Our durable, hardwearing composite doors will provide you with a long lasting performance. Get instant composite door prices today using our free online quoting engine. Our highly crafted timber replicas are made to measure to your unique specifications. We provide you with stunning composite doors to complement both your home and lifestyle, with doors available in low thresholds and stylish colours and finishes. Our friendly team are ready to answer any questions you may have so contact us today, on 01522 512020. You can also get in touch online, fill in our online contact form or drop us an email at sales@starglaze-windows.com.